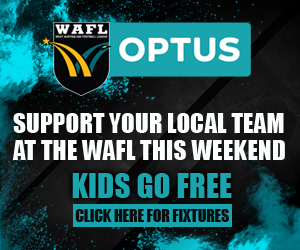 Ten of Western Australia's most promising young female footballers have been named in the 2019 NAB AFL Women’s Academy squads. Mikayla Bowen (Swan Districts), Rosie Deegan (Subiaco), Courtney Hodder (Peel Thunderbirds), pictured, Emma O'Driscoll (Swan Districts), Tayla Pescud (Swan Districts) and Roxanne Roux (East Fremantle), have been named in the Level 2 squad, while Abbey Dowrick (Subiaco), Brianna Hyde (Swan Districts), Mikayla Hyde (Swan Districts) and Sarah Verrier (Peel Thunderbirds) have been included in the Level 1 squad. They will each receive a NAB AFL Women’s Academy scholarship that provides high performance camps and personal development opportunities over a 12-month period. The first of three camps will be held at the Australian Institute of Sport in Canberra from December 16. The players will also join AFLW club training sessions throughout the pre-season. The 2019 NAB AFLW Academy squad has been selected after the 2018 NAB AFLW Under-18 Championships by a newly formed AFLW Academy Advisory group which has representatives from AFLW clubs and AFL state bodies; Bree Brock (Brisbane Lions), Trent Cooper (Fremantle), Alan McConnell (GWS Giants), Darren Flanigan (AFL Victoria), Luke Power (AFL), Luke Brennan (AFL), Gary Nicholls (AFLW Academy), Nicole Livingstone (AFL) and Aasta O’Connor (AFL). 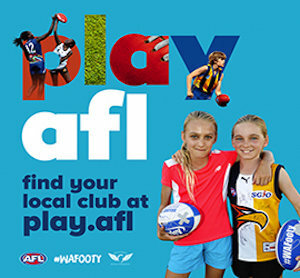 NAB has supported the footy community since 2002, providing boys and girls with a clear pathway from NAB AFL Auskick through to the NAB AFL Rising Stars Program all the way to the big time.